Android Notifier, A Very Useful Application To Make You Free From The Worry Of Missing Any Calls Or SMS. 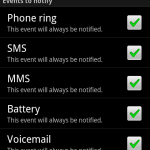 Android Notifier, A Very Useful Application To Make You Free From The Worry Of Missing Any Calls Or SMS. These days, it has become almost a fashion to use earphones to listen the music on your mobile phones while you are travelling or doing some work. Sometimes it can make you miss your important calls and messages which needs your immediate attention and action. Sometime, it … [Read more...] about Android Notifier, A Very Useful Application To Make You Free From The Worry Of Missing Any Calls Or SMS.